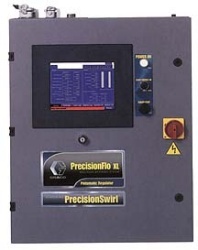 Graco's PrecisionFlo™ XL and LT systems are electronically controlled fluid metering systems that provide precise and reliable, closed-loop metering and dispensing of ambient and heated sealants and adhesives for automotive and industrial applications. Typical applications include gasketing, seam sealing, hem flange, sound deadening and body panel reinforcement. Industries benefiting from this technology include automotive (metal stamping, body shop, paint shop and trim shop), transportation, marine, appliance, window and door manufacturers and metal fabricators.